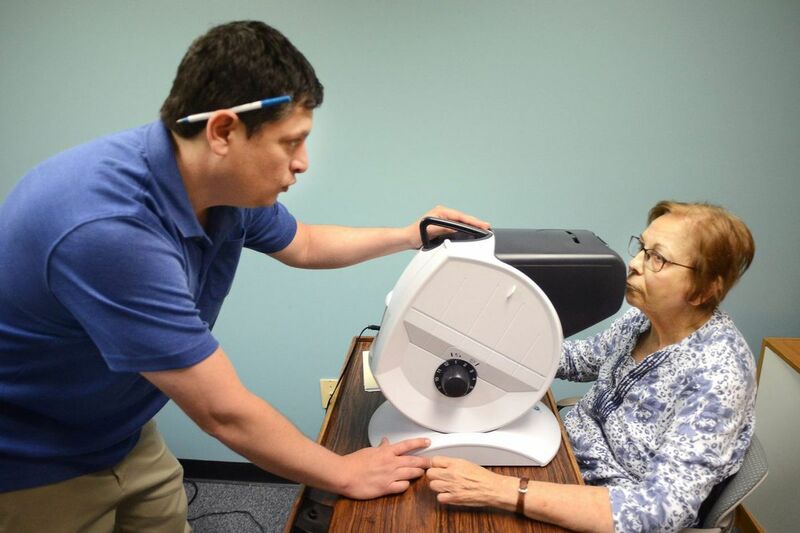 Sonia Margolis, 77, of Warminster, has her vision tested by Dennis Magrann, a certified driver rehabilitation specialist at MossRehab as she is evaluated for driving. As an attorney specializing in elder law, Jerry Rothkoff sees many adult children at their wits' ends about their parents' driving. It's "devastating" for a parent to lose the ability to drive, he said, but also terrifying to know your parent is a danger on the road. Here's his advice: Make somebody else the bad guy. Rothkoff has geriatric social workers on his staff who can help, but the most effective third parties, he said, are doctors and specially trained occupational therapists who can evaluate drivers with disabilities. "It's a very difficult issue and most people don't want to touch it," said Tom Kalina, a driver rehabilitation specialist with Bryn Mawr Rehab. Kalina, who is now 60, has been telling older people their driving days are done since 1989. He used to stay up nights feeling bad for people who had failed his tests. "Now," he said, "I look at it as it's potentially saving someone's life. What I do is help them put it into perspective." Tom Kalina, a driver rehabilitation specialist with Bryn Mawr Rehab, demonstrates a driving test with coworker Charmaine Henningham. Jason Karlawish, codirector of the Penn Memory Center, considers dangerous driving by seniors to be a public health issue. He's glad that Pennsylvania requires doctors like him to report drivers who they think are unsafe. (New Jersey has mandatory reporting for a much smaller list of conditions.) "No one has a right to drive," he said. "It's a privilege." He does not report everyone he diagnoses with dementia, particularly now that people are learning they have cognitive impairment earlier in the course of the disease. Some can drive during the early stages of some types of dementia. Dementia causes thinking problems that go well beyond memory, and driving is a complex activity that requires your whole brain. Karlawish gets particularly worried when patients have trouble with depth perception and visual orientation. He suggests that family members ride with an elder driver and notice whether he or she has trouble regulating speed or tailgates, crosses the median, or brakes abruptly. It's a "warning," he said, if adult children say they wouldn't let the grandkids ride with their parent. Carol Lippa, a dementia expert who is director of cognitive neurology at Jefferson Health, said other symptoms — impulsivity, inattentiveness, poor judgment, and slower responses — give her pause. She prefers for patients to quit driving voluntarily. She reports someone to the state only once or twice a year. She and Karlawish both rely on driving evaluators such as Kalina when they're on the fence or families need extra support. For $300 to $350, evaluators test cognitive skills that are associated with better driving and take people out on city streets to observe their real-world skills. Fox Rehab will do the evaluation in a driver's own neighborhood, but the price goes up to $600. That can be helpful for people who drive only under very limited conditions. Sonia Margolis, 77, went to the MossRehab Driving Program in Jenkintown in June seeking to regain her driving privileges. The Warminster woman said she became incoherent a year ago after a change in anxiety medicine. A psychiatrist at a local hospital recommended that her driver's license be revoked, and it was. Margolis was still furious while Dennis Magrann gave her a series of mental and physical tests that measured vision, visual perception, color recognition, depth perception, reaction time, range of motion, strength, and memory. An on-the-road driving test would have to wait until she got a special license for testing. "There's no reason I can't drive," she fumed. She conceded that her memory wasn't perfect. She'd had both knees replaced and had some neuropathy in her feet. She needed a walker for all but short walks. Otherwise, she said she had no significant health problems. It galled her to have to rely on her 84-year-old significant other, Norman Winokur, to take her everywhere. (He agreed that she should be able to drive.) "I want to go and do for myself," she said. "I'm not ready to give up driving yet. Maybe when I'm 80." She had no grand plans for cross-country road trips if she could drive again. "I'd go to the drugstore," she said. "I'd go get my hair done." Magrann, who has been doing these evaluations for 15 years, said her vision was fine, but he had concerns about her reaction time and her ability to move her legs. He wanted to talk to her primary care doctor before proceeding. "I don't think I'm going to get my license back," Margolis lamented. "I'm upset because of that damn doctor. She had no right to do that." Kalina said neuropathy, which can cause numbness in the feet, is often overlooked as a cause of accidents. "I've evaluated thousands of dementia people," he said. "Not one of them has put the wrong pedal down." Some people's deficits are so obvious, he said, that they never make it out of the parking lot. Kalina knows driving means freedom. It is a powerful "symbolic shift" when a license is taken away. One man told him all he wanted to do was drive to Home Depot. The man's wife said she could drive him, but Kalina knew the man really wanted time on his own. One older man, who did very little driving, cried when he learned he'd failed the test. "That was the one thing I could do," he said. One family brought in a 93-year-old man who was on oxygen and in a wheelchair. It was a struggle to get him in the testing car. His family looked embarrassed. "It was a pretty clear situation, but they wanted someone like me to convince him," Kalina said, "and I don't know if I did." The tests are not foolproof. After one man passed, his wife begged Kalina to recommend against him driving. "He's totaled three cars in the last three months," she said. Kalina stresses that families want older loved ones to stay alive. "You can hire another driver," he tells clients. "You can't hire another Mom." He also tells them they still have the power, and experience, to take control of their future lives. "This is another chapter," he says, "and you're the author." His work has made Kalina think about the inevitable day when he, too, will have to give up driving. For years, he dreamed of retiring to a cabin in the woods of Vermont. Now, he sees that, without a car, he'd be a prisoner in that cabin. He's thinking instead of something closer to home, where he'd be able to beckon Uber. Like many who work with the elderly, he thinks technology may provide the ultimate solution: a self-driving car.